Most policeman keep track of how long you’ve been parked in a spot by marking the tires with white chalk. This may be the only instance ever where they can measure the time by counting rings in a tree. 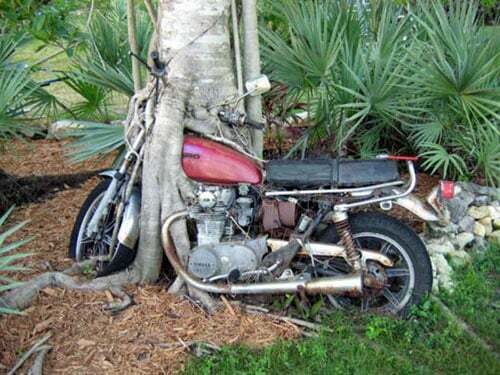 This must be what people are looking for when they are looking for a money tree. Instead of the normal throwing a penny into a fountain and making a wish, people hammer a penny into this log. I absolutely guarantee my wish starts off with a smashed finger on this one. I always have better luck with fountains anyway. This proves that anything against a tree for a long period of time will be eaten by it. This wash basin was merely leaning against the tree and with time, the tree has grabbed it and lifted it up. Another one of those, how frickin long has that motorcycle been there? This is definitely the best bike lock I’ve ever seen. You know those neighbors that never take down their Christmas lights? This is what they’re trying to get to. Lights grown right into the tree. Just plug them in and the tree is ready to go. I see a future in this one. A “plug in” live tree. This is what they call a “live frame” It only takes about 10 years to make each one. The funny thing about this picture is that despite the fact that the tree has swallowed the sign, we still all know exactly what the sign says. Evidently the photographer didn’t.